Over the past decade, historical GIS has emerged as a promising new methodology for studying history, which can be utilized to reorganize and reevaluate historical data. Historians, literary theorists, archaeologists and other academics are using advanced technology to establish a novel field that they are tentatively calling Spatial Humanities. 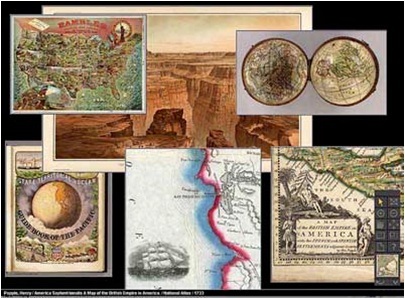 These scholars are using Serious Games for Studying History: Geographic Information Systems (Historical GIS) display and analyze information related to a physical location to re-examine real or fictional places in new ways. Spatial Humanities aims to revolutionize humanities scholarship by critically engaging the technology to determine the influence of geographical space on human behavior and cultural development. Humanities scholars explore the potential of spatial methods to discover relationships of memory, artifact, and experience that exist in a particular place and across time. Like the crew on the starship Enterprise, humanists are exploring a new frontier of the scholarly universe: space. 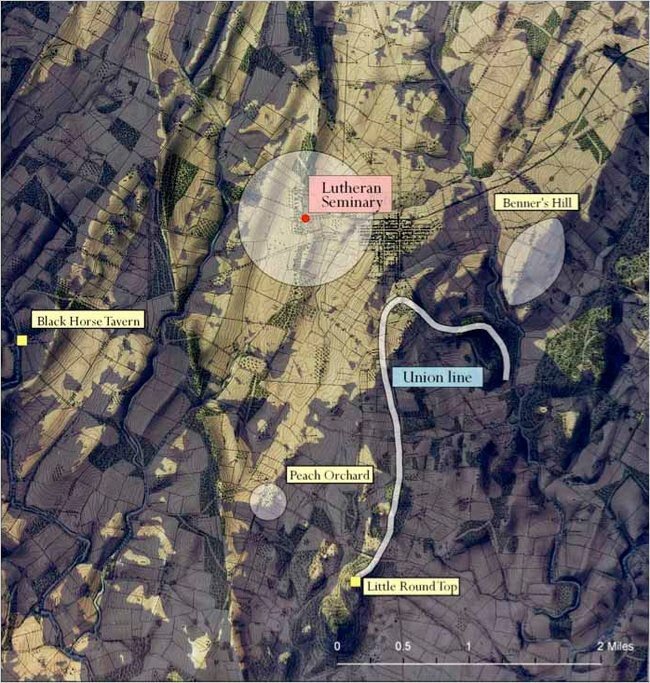 A viewshed analysis showing what General Robert E. Lee could have seen on the second day of fighting at Gettysburg. The light areas would have been visible. Anne Kelly Knowles posed a simple question that could not be accurately answered before: What could the Confederate General Robert E. Lee, actually see during the Battle of Gettysburg? Knowles’s team began by creating a digital map of the area’s topography at the time of the battle. Then, to replicate the view Lee would have had when he climbed to the top of the Lutheran seminary on the second day of fighting, the team generated what is known as a “viewshed” from a point 75 feet above the terrain — the distance from the ground to the cupola floor plus Lee’s eye-level standing in his boots. The pale white ovals in the map at right indicate areas historians have previously identified as visible to Lee from this vantage point. According to the viewshed analysis, Lee could have seen considerably more. All the light areas on the map would have been visible, including much of the northern half of the battlefield. Little Round Top and the high ground along Emmitsburg Road near the Peach Orchard, where Lee had intended Lt. Gen. James Longstreet’s corps to attack the Union line with artillery fire, might also have been visible. The viewshed analysis presumes a bald landscape, so in reality some sightlines would have been limited by trees and other obstructions. Advanced mapping tools, around since the 1960s were initially used primarily for environmental analysis and urban planning. In the late 1980s and 1990s Geographic Historical Information Systems enabled scholars to take census information and other quantifiable data and plot changes in a location over time. By the late 1990s professional networks and organizations began to form, but this sort of mapmaking remained on the margins. The Scholars’ Lab at the University of Virginia Library has developed a new Spatial Humanities website the up-and-coming generation of digital mapmakers. Bethany Nowviskie, the director of digital scholarship at the library, explained that the site serves as both a clearinghouse of projects and sourcebook of information for those interested in using Geographic Information Systems in their scholarship. The Scholars’ Lab site also includes short essays on what the trend means to anthropology, literature, religion and architecture; articles, research and monographs related to spatial humanities; and step-by-step tutorials on how to use the new tools and resources for teaching and scholarly work. It describes how to convert a list of street addresses to points on a map, or how to make historic maps spatial.